Poggiotondo by Alberto Antonini is a new star in the wine scene of Tuscany. In many markets, the wines are already very present , but still quite unknown in Germany. We want to change that! Jancis Robinson is enthusiastic and describes the wines with the word "energy", Vinous rated all wines with 90/100 points upwards, the magazine DECANTER designates Poggiotondo as one of the "50 Starbuys of 2015". The history of the winery begins in 1968, when Carlo Antonini, teacher and bartender, buys the historic property of Conte Guidi in Medioevo. Today Carlos son Alberto farms the estate with its 28 hectares of vines with great passion. 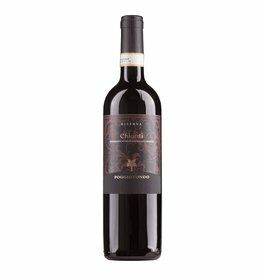 He studied viticulture in Fiorentina, Bordeaux and California and worked for Frescobaldi and Antinori as an oenologist. Today, he serves many customers all over the world in addition to his own vineyard. A real Koryphae, you can remember it with every sip of this wines. After a 3-year conversion phase, the Poggiotondo wines have been organic certified since the 2014 vintage. Try it!